My next typing is going to be about Mouri Ran from the Detective Conan. For a change I am going to try to use the format that most of the other sites are using. A lot of times Ran is going to be remembering the past. 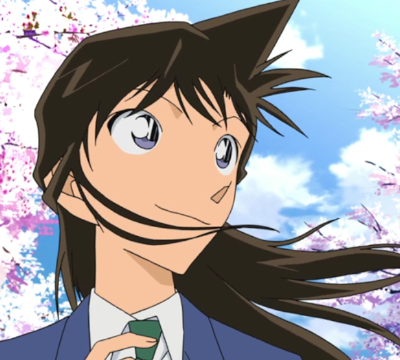 Let it be when she was reminded of the first meeting with Shinichi when seeing cheery blossom or thinking about meeting Akai when seeing the article about the FBI. Not only that, she does not see the world in the objective way, the same way that Se types would, but in what the impression makes on her, which is indicative of the Si types. For example the feeling she gets when meeting Sera. Not to mention, she continue to try and get their parents to be together, even though they have not been for about 10 years, but were before that. She is very past oriented. Ran is much more aware of the feelings that other people have than her own. She is also less likely to show her feelings, if it goes against the harmony of the group. For example, in the kindergarten, she pretended that she was alright with her nameplate being destroyed and only cried when the others were sleeping. She was also a type of person who let everybody slide before her. Not to mention that while she is a teenager, she is making sure that everybody is her household is taken care of. She does also have the Ti reasoning abilities. For example, when she was in the kindergarten, she could realize why Shinichi did what he did. She was also be able to solve multiple cases by herself. While usually she acts quite normally, when she is presented with the situation that she does not understand, she can jump to quite creative conclusions. Be it that the person has supernatural and was able to see the dog through the wall in the middle school. Or that she thought multiple times that Shinichi had shrunk. Or that a ghosts exist. Alright, I decided that I don't really like this format, so I will most likely continue in a different format next time.